Your vet's office probably has a cat weight chart pinned up on one of the walls. 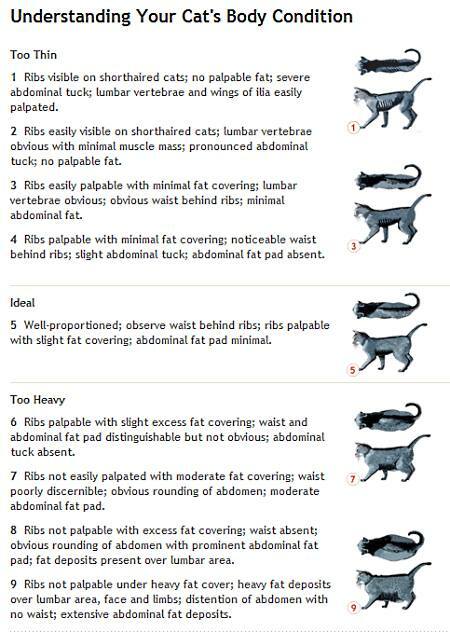 You can use this chart to determine whether or not your cat is under or overweight. Two common questions asked by cat owners are "what is a healthy weight for my cat?" and "is there a cat body weight chart I can use?" We covered healthy cat weight and the need to keep your cat trim. On this page, we'll look at the same type of cat weight chart that your vet would reference to evaluate your kitty (often referred to as a cat body condition chart). One chart is from the Iams cat food company and the other is from the Purina cat food company. If you're familiar with the claims by cat health experts that dry cat food, along with "free choice" feeding options is largely the cause of obesity in cats, you might note the irony. 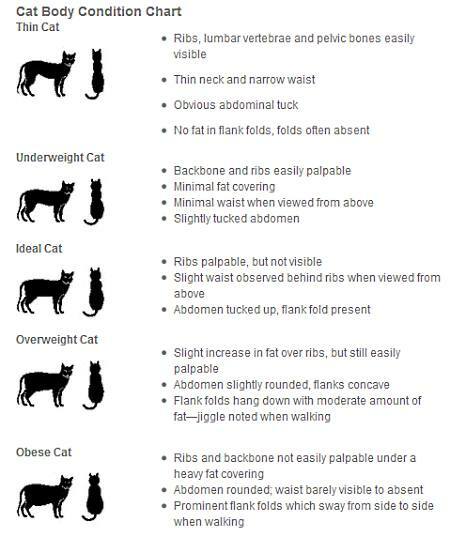 While each chart uses a slightly different description for each of the cat body types, they both agree on the basics. Ribs visible on shorthaired cats; no palpable fat; severe abdominal tuck; lumbar vertebrae and wings of ilia easily palpated. Ribs easily visible on shorthaired cats; lumbar vertebrae obvious with minimal muscle mass; pronounced abdominal tuck; no palpable fat. Ribs easily palpable with minimal fat covering; lumbar vertebrae obvious; obvious waist behind ribs; minimal abdominal fat. Ribs palpable with minimal fat covering; noticeable waist behind ribs; slight abdominal tuck; abdominal fat pad absent. Well-proportioned; observe waist behind ribs; ribs palpable with slight fat covering; abdominal fat pad minimal. Ribs palpable with slight excess fat covering; waist and abdominal fat pad distinguishable but not obvious; abdominal tuck absent. Ribs not easily palpated with moderate fat covering; waist poorly discernible; obvious rounding of abdomen; moderate abdominal fat pad. Ribs not palpable with excess fat covering; waist absent; obvious rounding of abdomen with prominent abdominal fat pad; fat deposits present over lumbar area. Ribs not palpable under heavy fat cover; heavy fat deposits over lumbar area, face and limbs; distention of abdomen with no waist; extensive abdominal fat deposits.